Explore the mystical and energetic relationships to ourselves and the world around us. This is a new age of enlightenment and change. We are all working together to create a better world by taking care of our earth and sharing a positive approach to the new era. 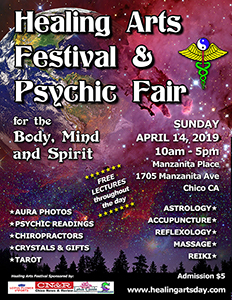 Explore new science, ancient mysteries, alternative health, and spiritual teachings. Purchase books, crystals, jewelry, or other wholistic products. Come and have some fun discovering new mysteries! There is a Healer out there for everybody – find yours! To bring medical and alternative practitioners and products together, providing a thoroughly comprehensive event for the community. You will have a unique opportunity to learn about therapies first hand in order to make wise choices about your health involving your Mind, Body and Spirit. Make contact with therapists, practitioners and organizations to gain new insights into modalities in natural healing and psychic development.